The Snake 32" Single Hose Hookah is a very decorative Hookah that features a gold colored snake that wraps around the Stainless Steel Shaft. The Snake Hookah's Shaft consists of six pieces that can be disassembled to provide for easier cleaning. This Hookah was manufactured in Syria and contains a decorated Glass Vase that elegantly complements The Snake Hookah's Shaft. 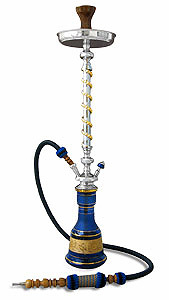 This Hookah may be used for both decorative and smoking pleasures, providing entertainment for years to come.